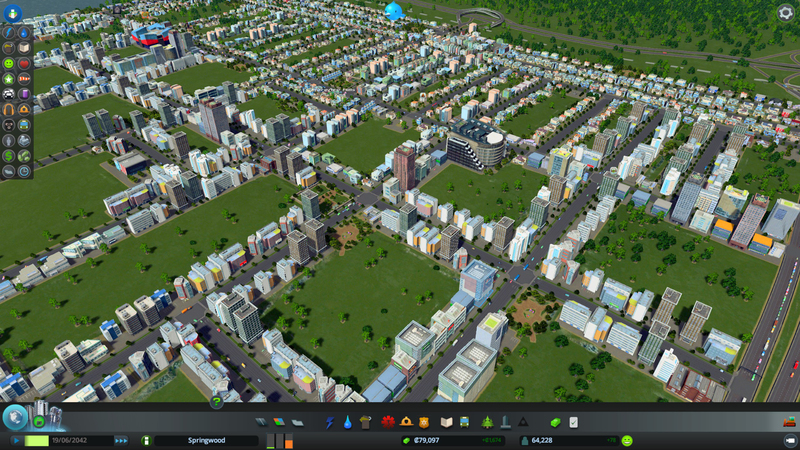 If you grew up passionately playing games from the SimCity series, the past few years may have been troubling for you. 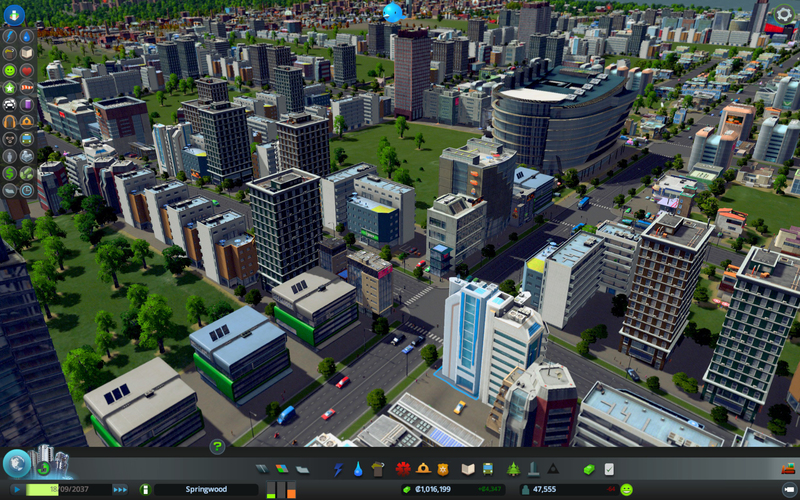 There’s really no way to sugarcoat it other than saying that for the most part, the city builder genre has been plagued with average games, despite all other genres advancing with better technology, game engines and more. 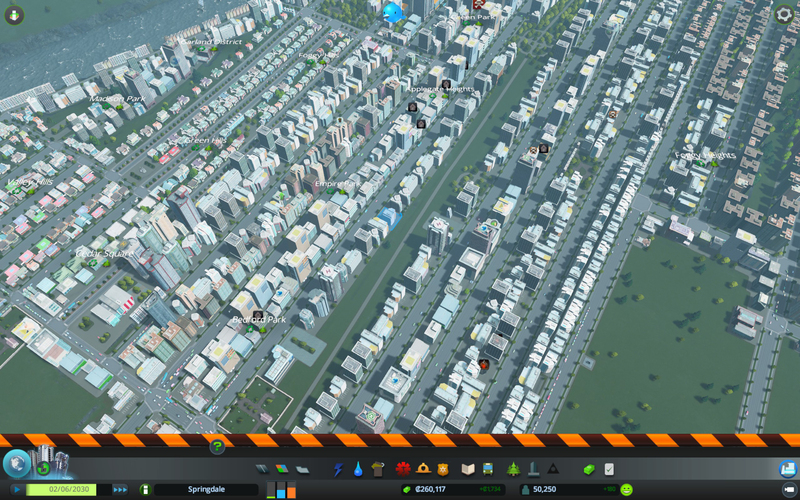 Developer Colossal Order and publisher Paradox Interactive are hoping to buck the trend with the release of Cities: Skylines, which is not related to Cities XXL that was released earlier this year (review here). 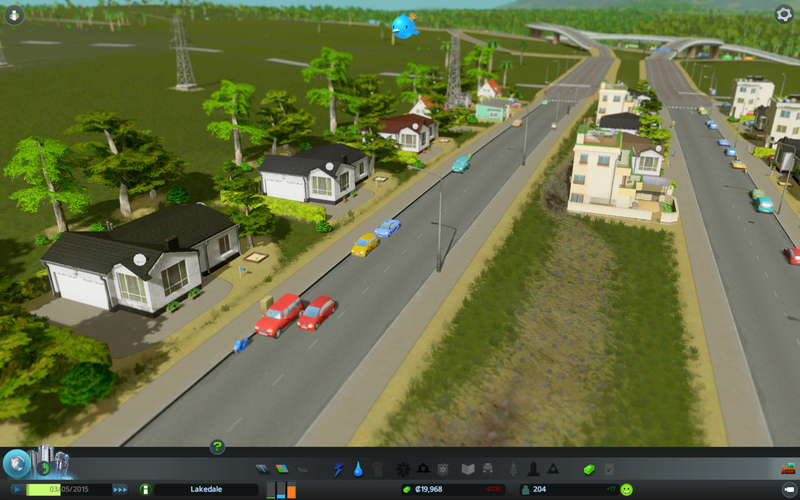 The minds behind Cities: Skylines are the same that developed Cities in Motion and Cities in Motion 2, which are both city-based mass transportation simulators. 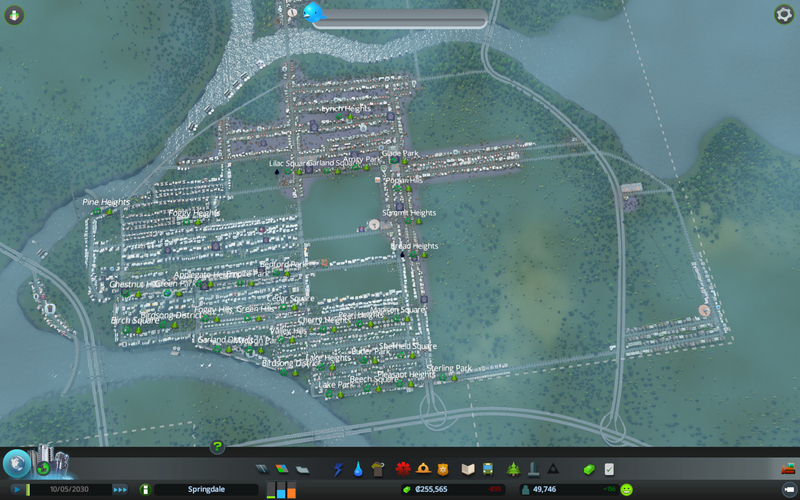 With Cities: Skylines however, Colossal Order wanted to expand beyond just simulating traffic, trains, buses and trams, creating a full-blown city builder that has you managing a growing population sprawling across numerous tilesets as you work your way to becoming a successful mayor. 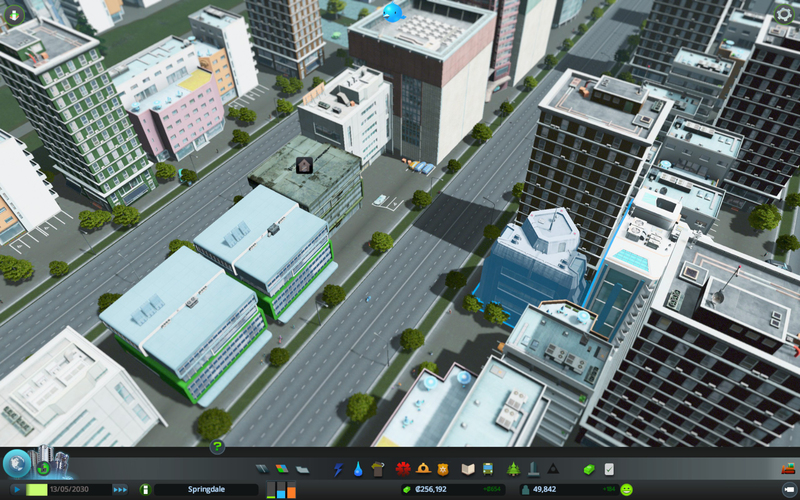 Naturally with the disaster that was SimCity in 2013, I started up Cities: Skylines being cautiously optimistic. 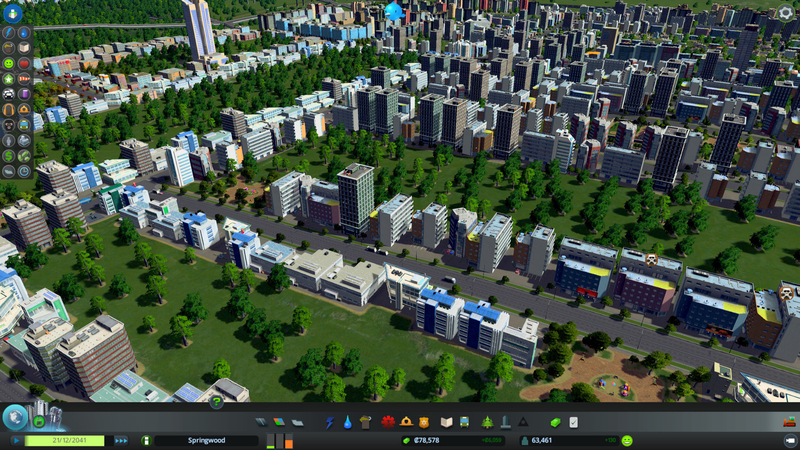 Prior to handing out review codes, Colossal Order had done an impressive job sharing with the community its vision of Cities: Skylines and how it may be the ultimate city builder available today. 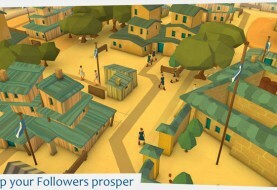 Will the game live up to city builders’ lofty expectations? 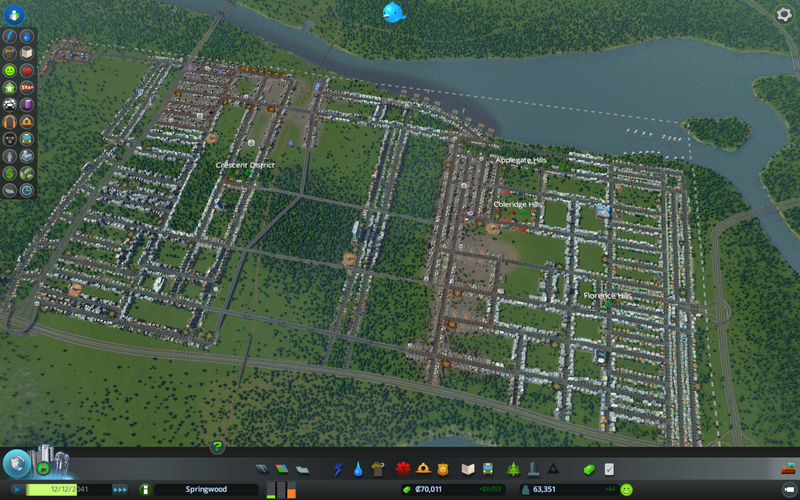 Dare I ask, is Cities: Skylines everything fans of the genre wanted from SimCity? Read on to find out. 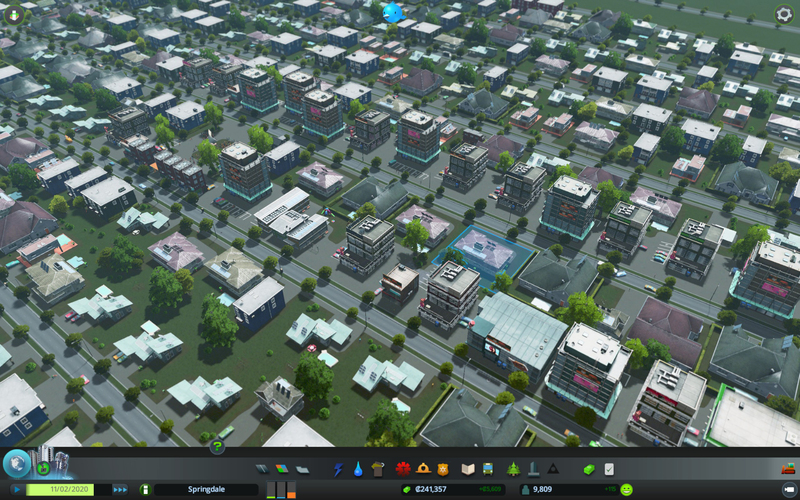 From the onset, Cities: Skylines assume you have prior knowledge and experience with the genre. There isn’t an in-depth tutorial to go through, although there are popups that guide you on your way to start. 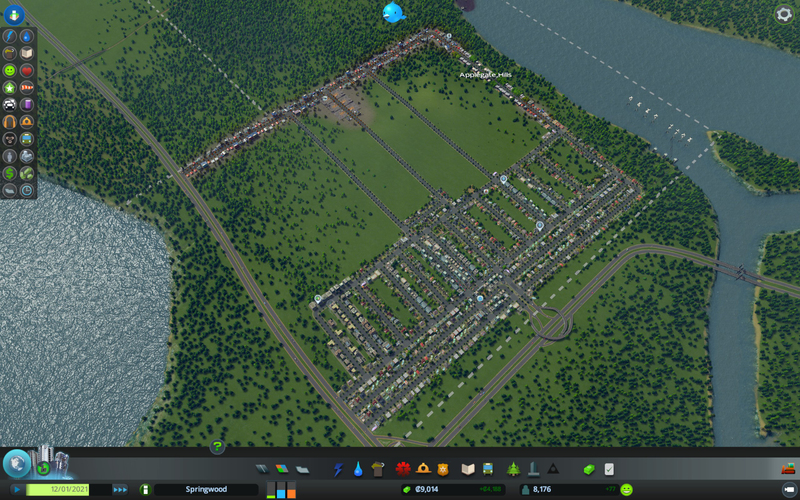 Like other city builder games, you’ll begin by laying down roads, setting up zoning, power and water. 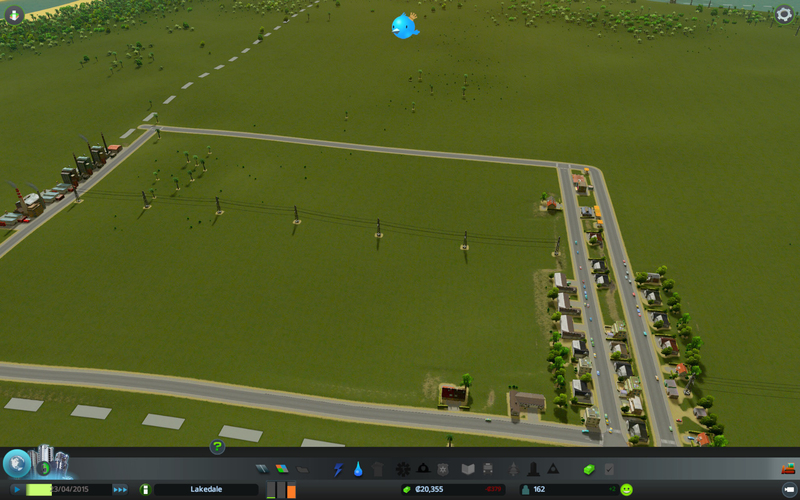 For those that played older SimCity games such as SimCity 2000 or even the original SimCity, you’ll appreciate the requirement of having to build power lines and water pipes to connect your city in order for it to function. Power is capable of hopping from building to building and across roads, but water pipes will require you to connect and join existing ones in order for the H2O to flow freely to your new buildings. And where there’s an in, there has to be an out, which means you’ll also need to build water drain pipes or treatment centers to dispel the sewage. In terms of basic utilities, water and electricity are your two core components and there’s a decent variety of power sources ranging from wind turbines to a hydro power plant that is essentially a dam that can be built across a river stream. 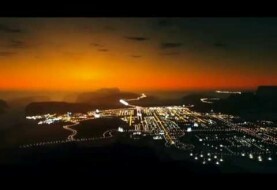 Green options include a solar power plant and later on you’ll be able to unlock the fusion power plant. My personal favorite was the advanced wind turbine that allowed you to save space on land by generating power on the water. 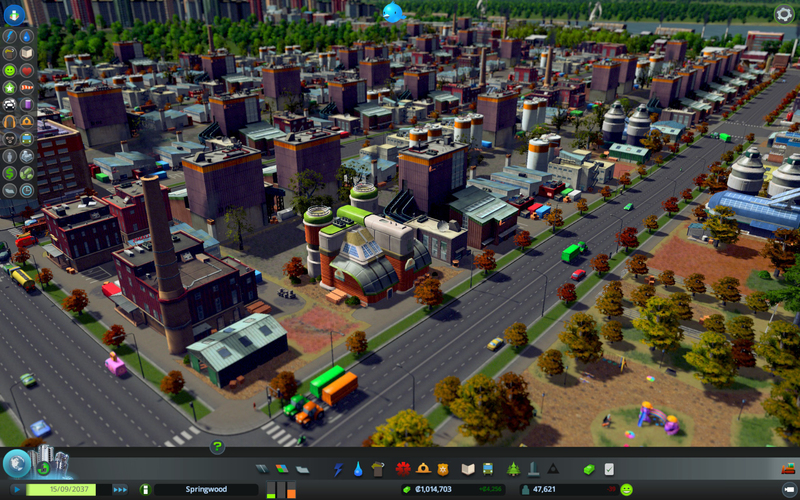 It’s also a convenient structure to have feeding power to your water pumping stations so you don’t have to destroy the look for your city with power lines. 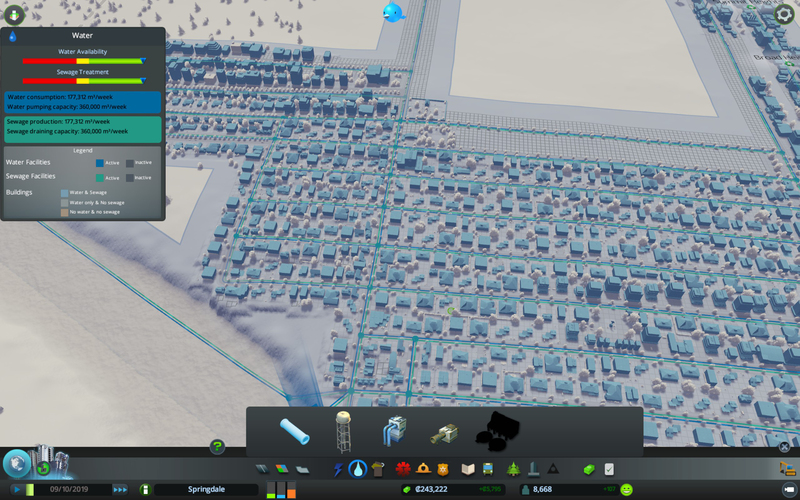 But once you get your basics down, Cities: Skylines open up to a world of opportunity, but it does so at a reasonable pace that eases in beginners while satisfying veterans. 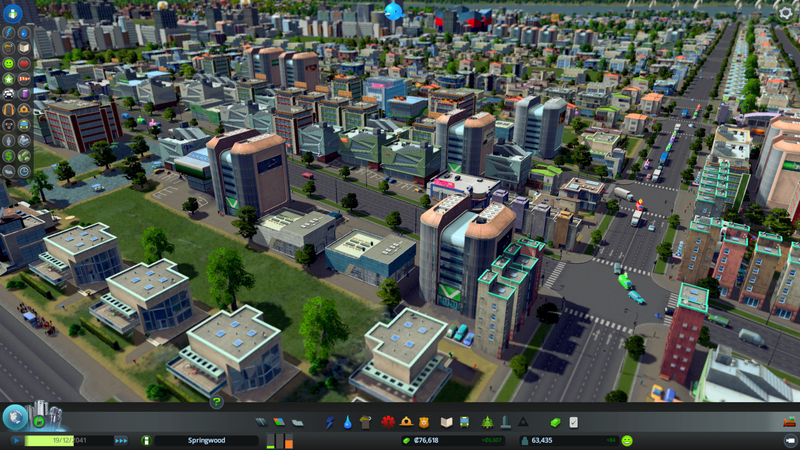 You see, buildings unlock based on population milestones, like garbage collection and healthcare at 500 while other city services such as fire and police departments unlock at 1,000 population. 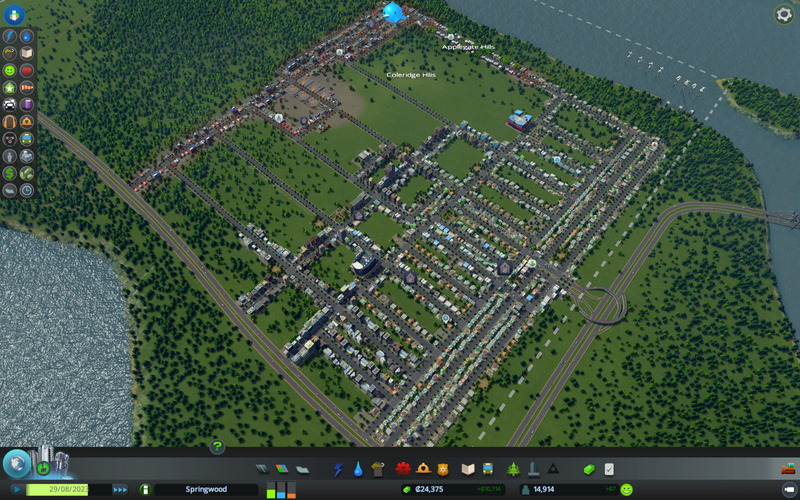 Getting to 1,000 population isn’t hard work by any means, but you’ll quickly notice that residential zoning in Cities: Skylines doesn’t follow the same formula as other city builders. 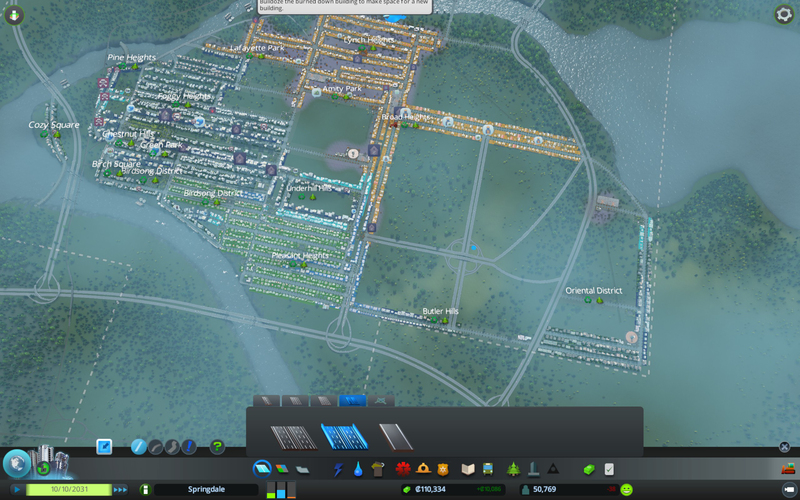 The game is a bit more on the realistic side when it comes to how many residents each “zone” has and unlike other city builders that try to artificially inflate your population numbers, Cities: Skylines actually requires a bit of work to reach a population of 50,000 or even 80,000. 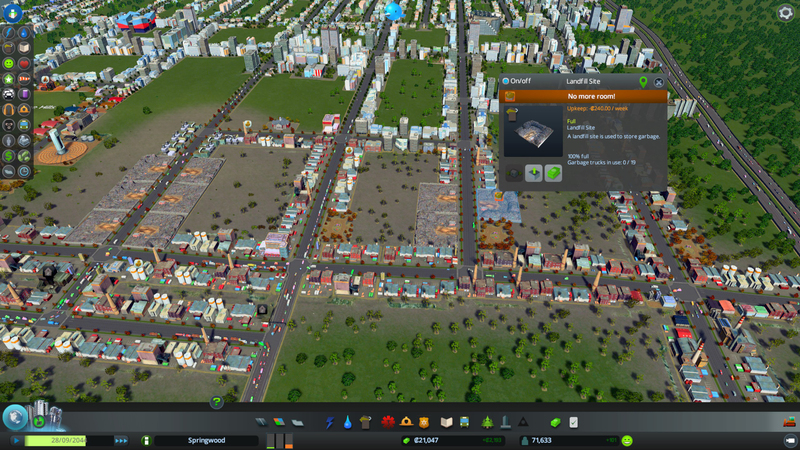 Dead bodies can plague your city if they aren’t removed quickly through hearses. 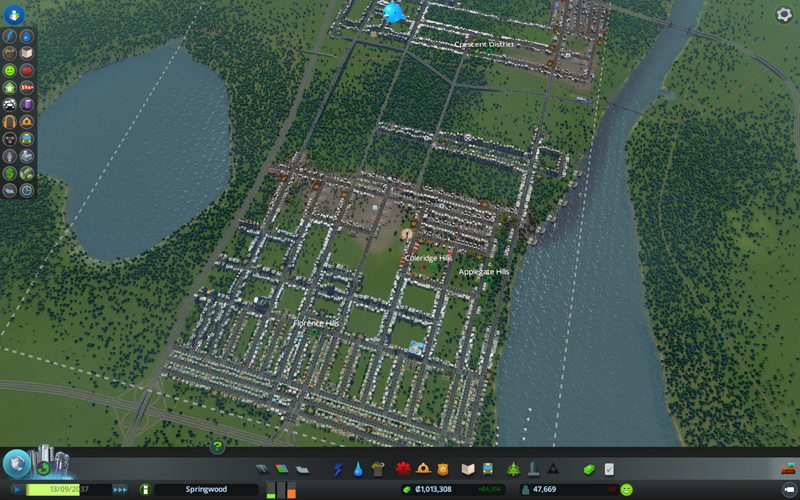 I really enjoyed the rate of progression of my first city in Cities: Skylines. 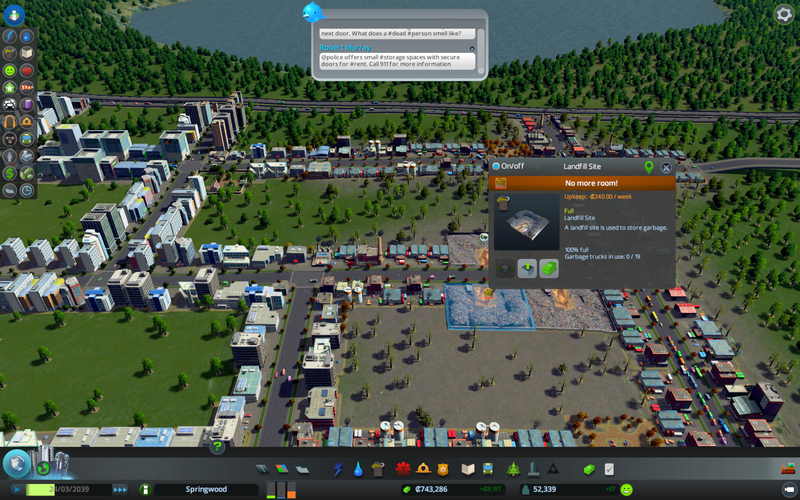 After getting comfortable with setting up landfills, you’ll unlock incinerators that allows you to burn the garbage that has gathered up. 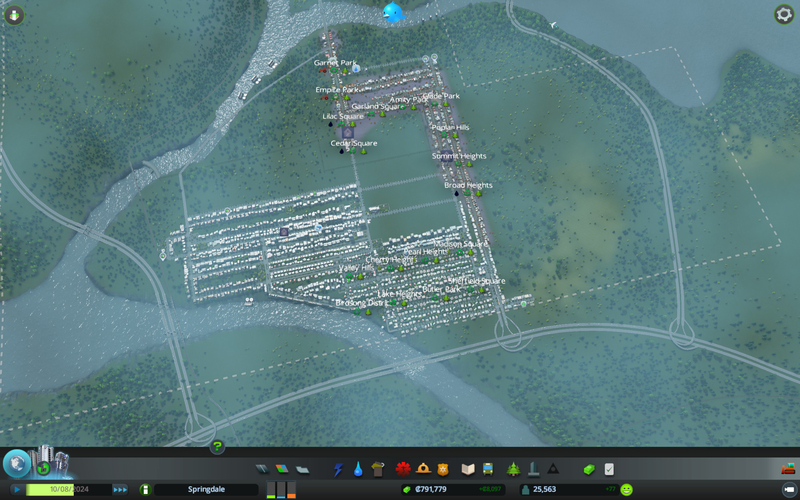 One of the more interesting mechanics in Cities: Skylines is the necessity of having to manually set buildings such as landfills and cemeteries to empty out once they’re full. In situations like that, the buildings are actually not performing their duties but are using the resources – such as garbage trucks and hearses – to shuttle the waste or dead bodies to an incinerator or crematorium. 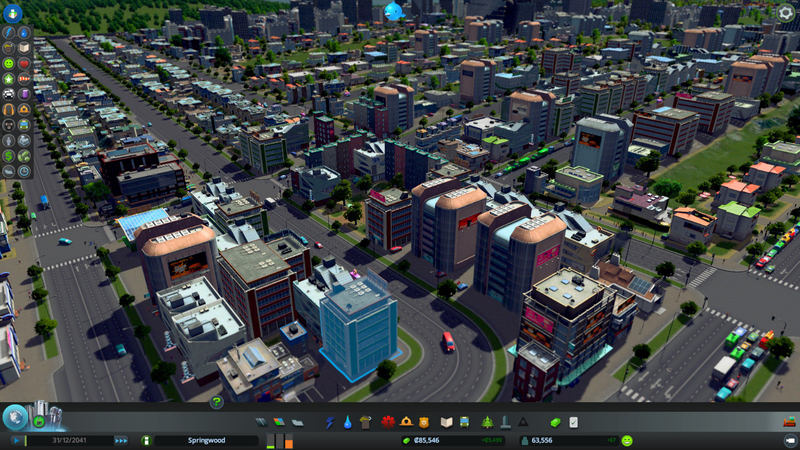 In a way, it acts as an anti-AFK mechanic, meaning that you can’t just setup your city to be profitable and walk away for a few hours to save millions of dollars into your bank account. Not paying attention to filled-up garbage dumps and cemeteries can lead to citywide chaos where residents start abandoning their homes from garbage piling up, or worse, the stench of dead bodies. Admittedly, the idea of having to deal with the dead is an interesting one, putting a focus on healthcare as well as having to micromanage your services so that they’re performing adequately. More importantly, it puts a major emphasis on ensuring your city’s traffic flows properly. Like other city builders where fire departments, garbage pickup and even the police can be ineffective due to heavy traffic congestion, the addition of having the dead hauled away is another issue that mayors will have to deal with. 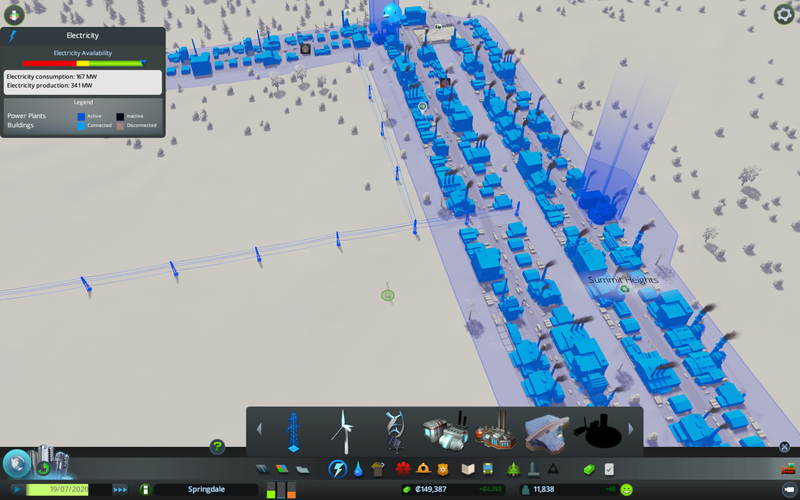 It’s no major surprise, considering Colossal Order previously developed mass transportation simulators, that Cities: Skylines has a variety of ways to cut down on traffic. Transportation options range from bus lines to metro lines while tourists and industry trade can visit your cities through train, boat or airplane. Even roads expand beyond your basic variety of single, double or triple-lane options with complex intersections that can link up highways from one major city center to another. 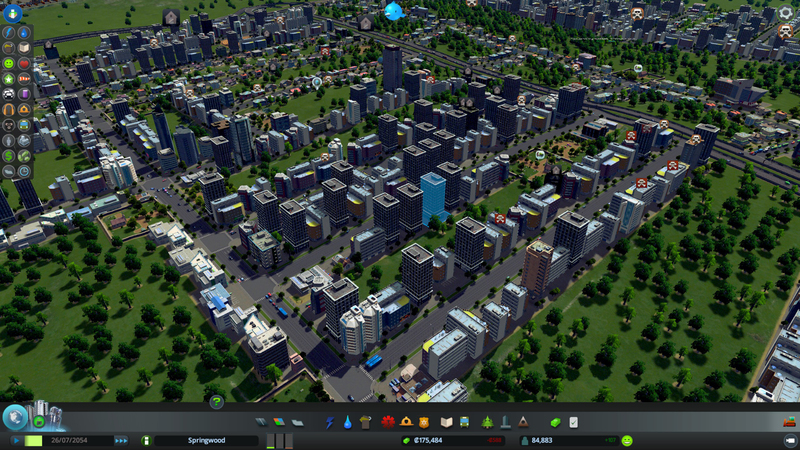 And you’ll need to take advantage of some of those aspects as you unlock more tilesets as your city grows. 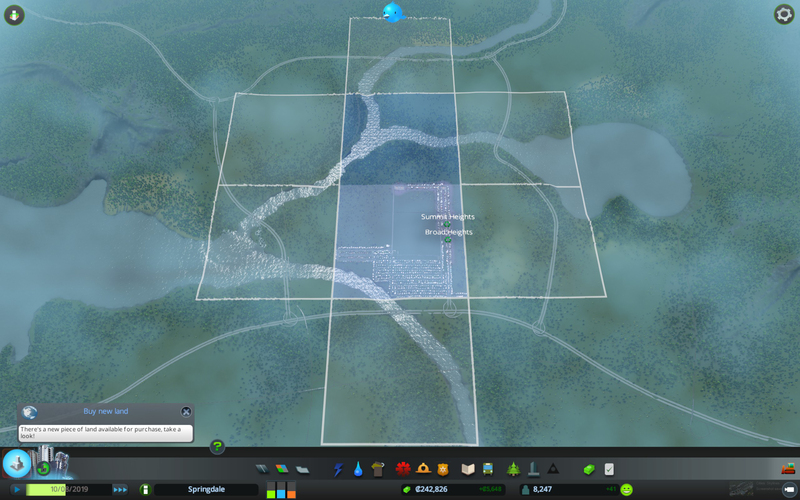 Cities: Skylines starts you off with a small, manageable plot of land, but as you continue to progress, adjacent tiles become available for purchase so that you can expand your city. 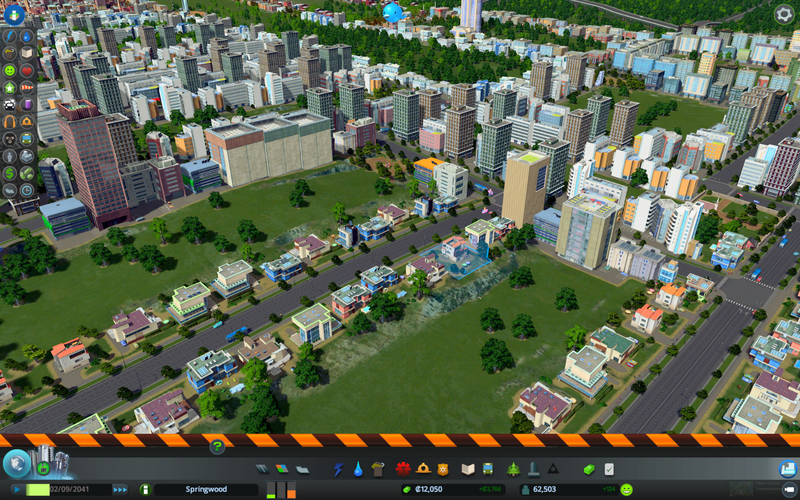 Planning ahead is key, but there’s also plenty of fun to be had by dividing up your massive city into areas – some that can focus on certain aspects. The game lets you to do that by allowing you to assign districts to areas of land so that industry can specialize in harvesting available resources. 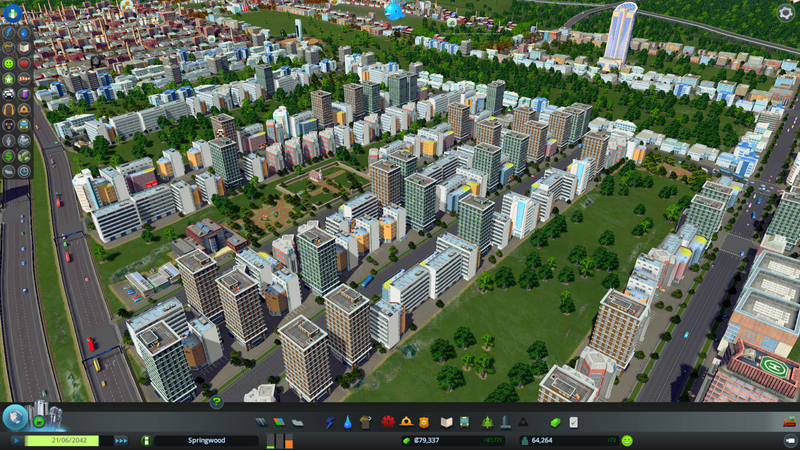 For example, if your plot of land is rich with forestry, you can create a district where all the industry zoned within that district will specialize in forestry. Other resources include farming, ore and oil, each with their pros and cons. 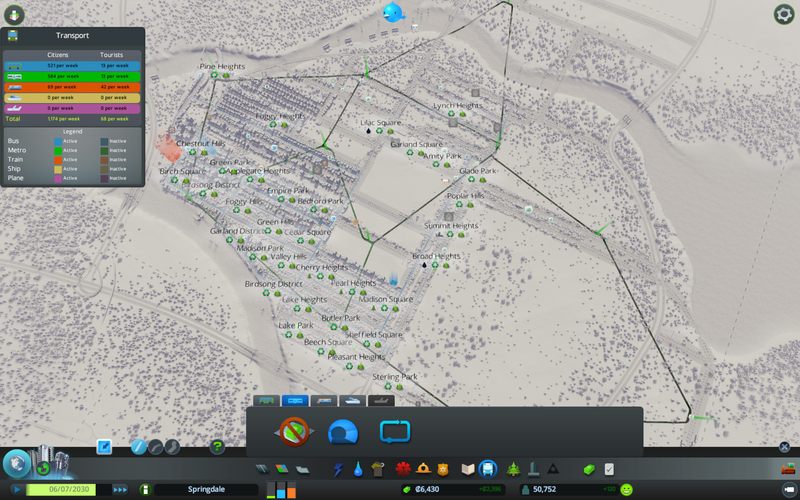 This also allows you to have traditional industry setup in your city along with specialized ones, and instead of having separate buildings that need to be managed, you’ll simply zone industry in a certain district to take advantage of natural resources. The ultimate city builder? 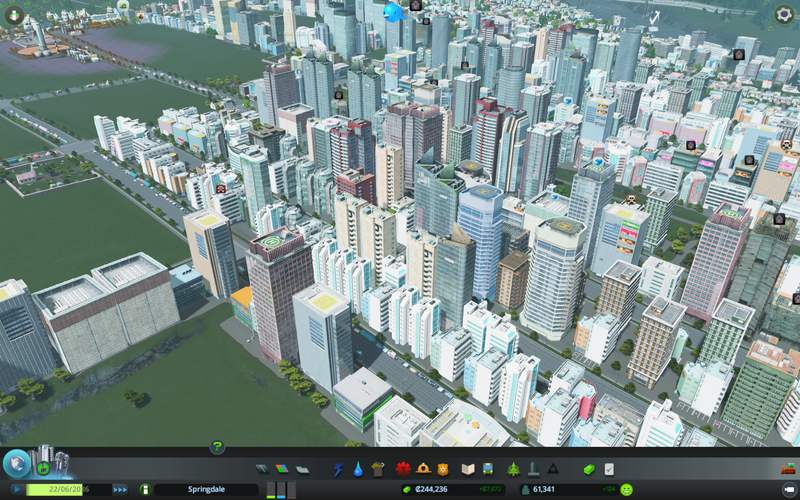 Cities: Skylines has a map for that. 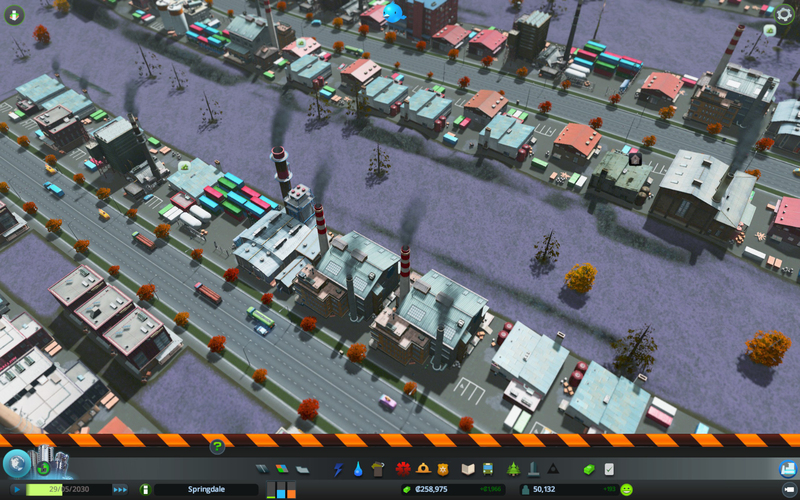 While there are no natural disasters in the game, buildings can burn down from fire and sickness can spread quickly due to ground or water pollution. There won’t be any tornadoes or earthquakes occurring that destroy your buildings, but let the dead get out of hand and you’ll be staring down at dozens of abandoned buildings that need your attention. 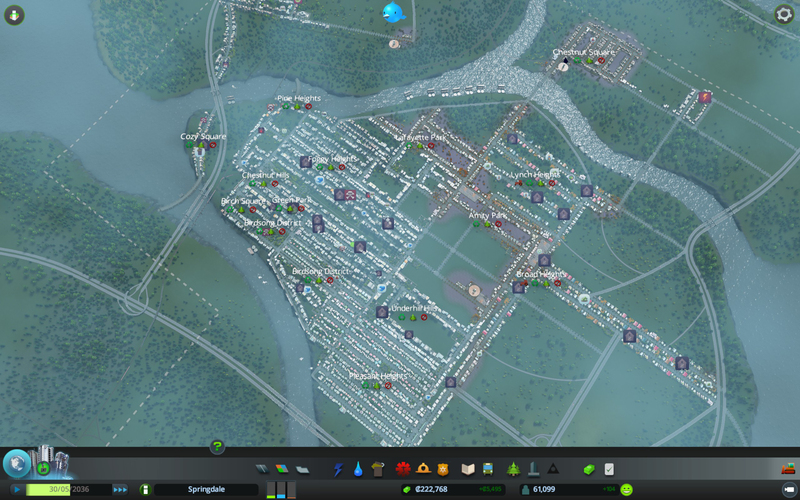 Forget to build a water treatment plant and your citizens will get sick. So in a way, Cities: Skylines has its own version of disasters, which happen more organically and realistically. It’s actually a welcomed change, where other city builders and their disasters are seen as inconveniences that can’t be prevented, Cities: Skylines rewards you so long as you pay attention to what’s going on. 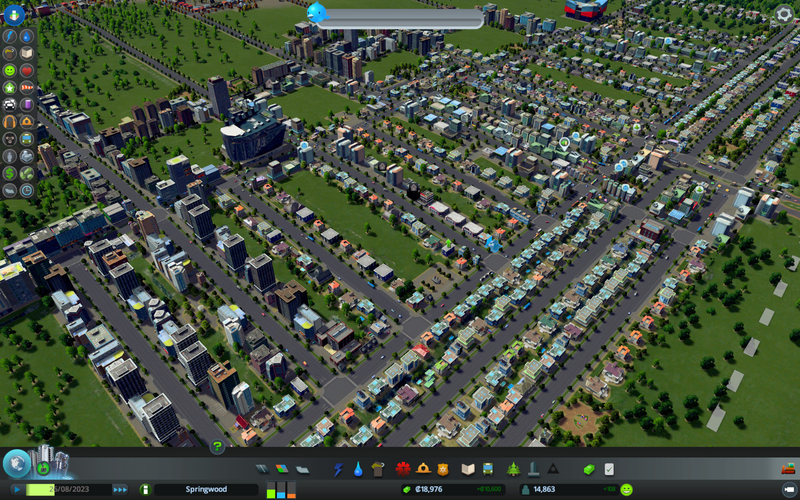 As your city grows bigger and bigger, you’ll find managing your citizens’ happiness will become harder and harder. 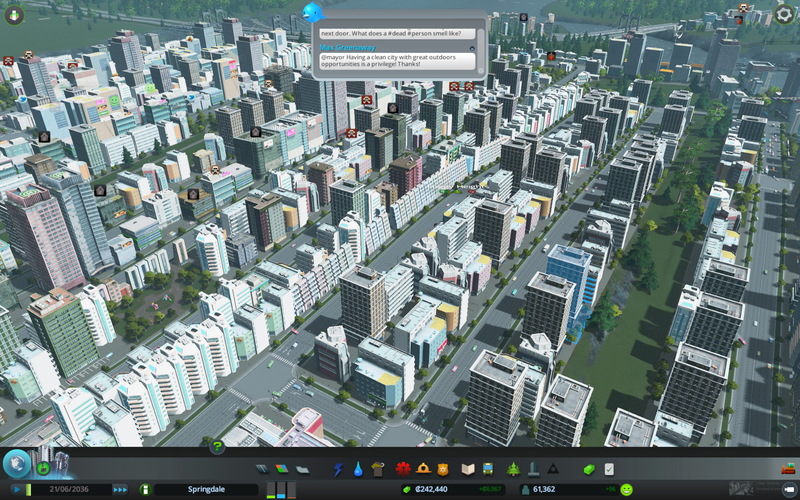 Cities: Skylines takes a rather unique approach to letting you know when there are issues, with “Chirper” acting as an in-game social media source that gives you vital information about your city from your citizens. In other words, you get to see your citizens Tweet with hashtags and all. In the beginning it’s novel, cute and even helpful, but Chirper suffers from too many messages to the point that it’s downright annoying. 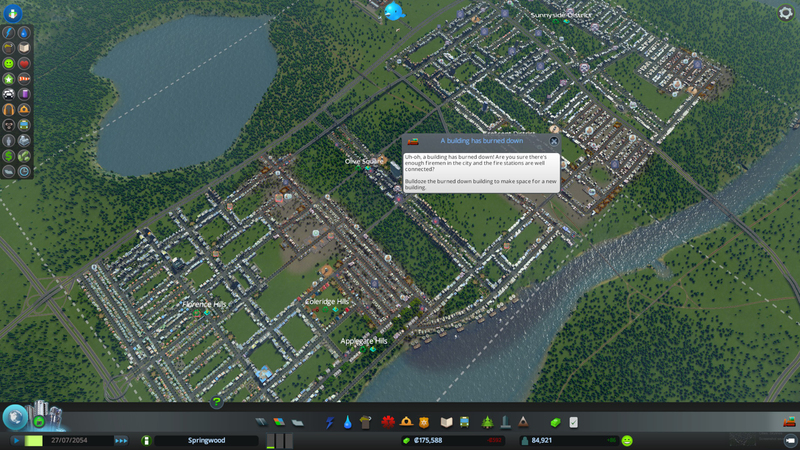 Within an hour of playing Cities: Skylines you’ll likely tune out the bird and ignore any messages that even pop up, which is a bummer since sometimes they’re actually really important. The messages even get repetitive with little variety and some appear to be meaningless fluff. You are able to turn off the auto-open of Chirper messages, but the game would have benefited from a notification system that kept things relevant. Of course you can check the status of your city and its services the traditional way by opening up maps that overlay vital statistics. 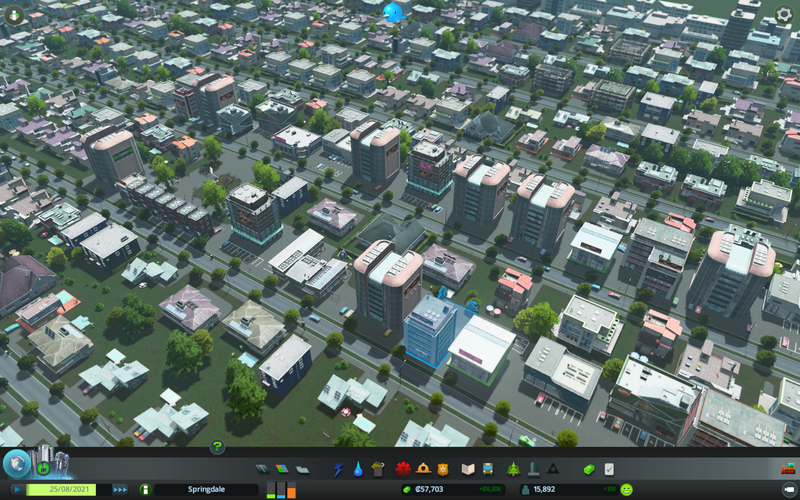 Like the rest of the UI in Cities: Skylines, everything is easily distinguishable at a glance and the team at Colossal Order should be applauded on just how user-friendly and easy on the eyes everything is. 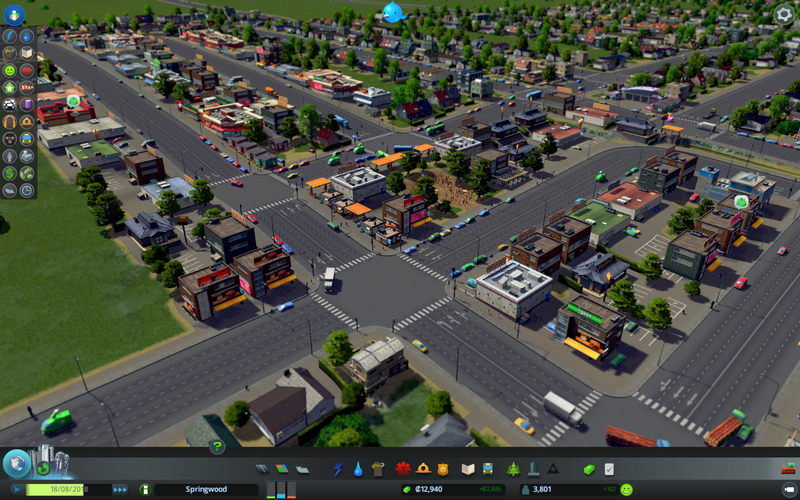 Those that are new to the city builder genre won’t be overwhelmed by the game and despite not having an in-depth tutorial that holds your hand, you’ll be able to grasp the core concepts easily through visual guides and bright colors. Who doesn’t understand that red means bad? 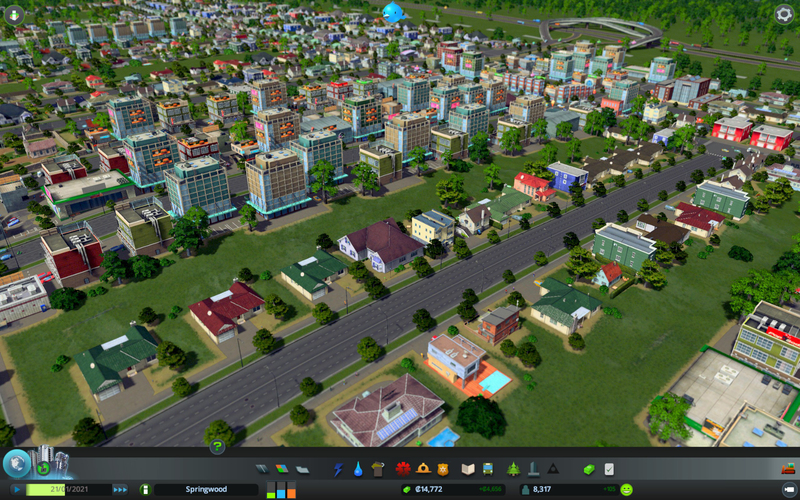 So far, everything about Cities: Skylines sounds fine and dandy – but what are the goals of the game? Is it sustainable? Are there features that drive you to want to build the ultimate city? Fortunately there is, and they’re plentiful. Best of all, there’s a variety of unique buildings that can be unlocked and you’ll have to obtain them in order to build the monuments in the game. 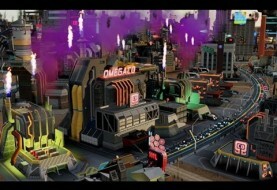 Unlocking the unique buildings in the game require specific parameters to be met, ranging from constructing 300 city service buildings to setting all tax rates to a maximum of four percent. 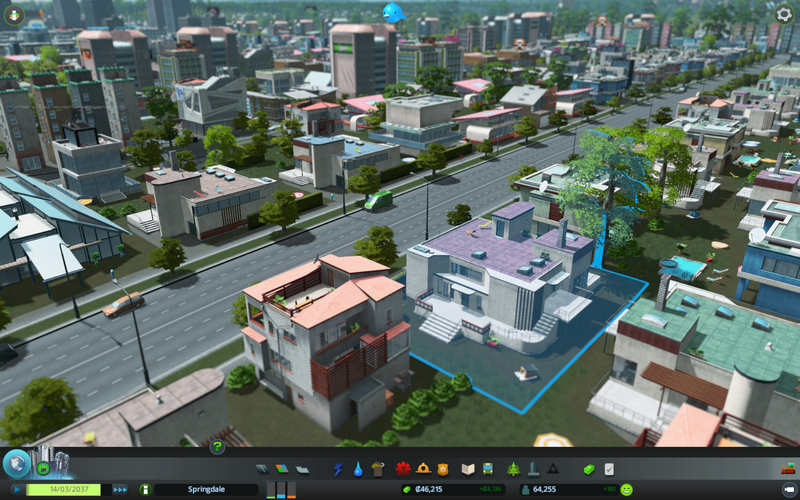 Some of the unique buildings can only be unlocked by being a “bad mayor,” like having 1,000 abandoned buildings in your city or having an unemployment rate greater than 50 percent. The good news is, once you unlock a building it’s yours to keep for any subsequent city, which means you don’t have to ruin a good city just to get access to the monuments. You can’t just AFK away to let your bank account grow in this game. There’s a great deal of depth involved to building the ultimate city. 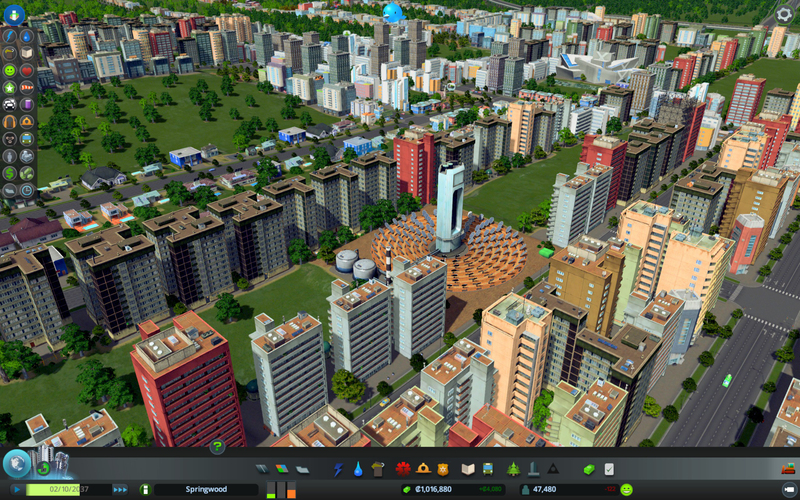 One that thrives with a bustling population with all its citizens content. To help you achieve your goals, there are city policies that can be enacted such as recycling, smoking bans, education boosts and recreational use. That’s right, enabling recreational use of controlled substances will attract more tourists and increase tax income while slightly reducing crime and increasing your police budget by 15 percent. You can also fine tune your tax rates based on low/high density zones even giving tax relief for low density residential zoning while raising the taxes for high density residential. Lastly, there’s a city planning tab set of policies that will allow mayors to ban heavy traffic and highrises or invest into turning their homes into “much cooler smart-homes” through high tech housing. 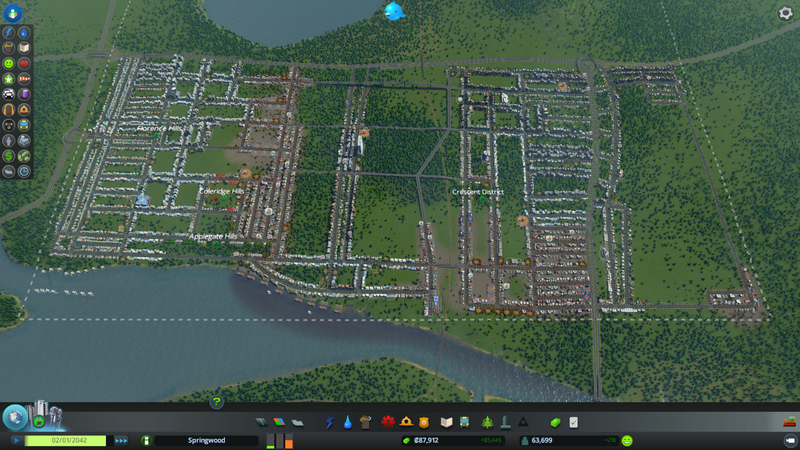 Now as far as the game is concerned, everything is unlocked at a population of 80,000 (Megalopolis). 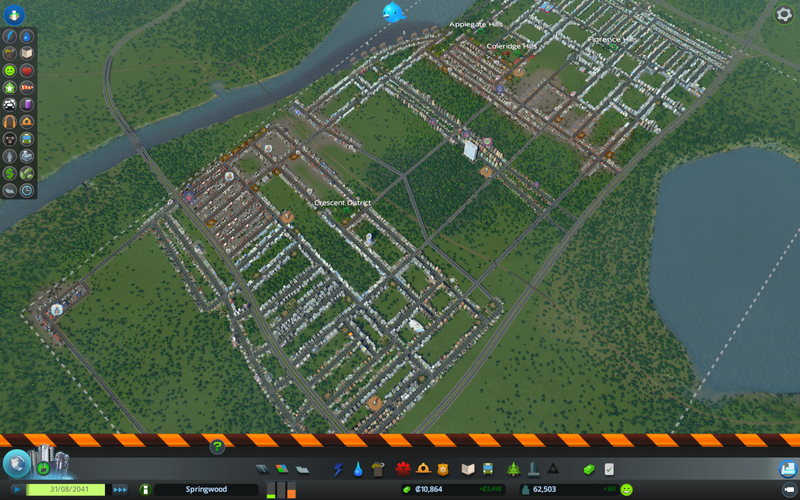 The development team has confirmed that Cities: Skylines has a population cap of one million, but don’t expect that to stay around thanks to mod support. In fact, with just preview copies being released, there’s already a mod that allows you to purchase up to 25 tiles rather than the default cap of nine. It is likely that many of these restrictions were put in place to ensure a variety of computers are able to handle the game, but if you’ve got a strong enough rig and the ambition to manage over one-million citizens, the community is there to feed your addiction. The game also comes with a couple of tools, one for editing maps and one to edit assets. 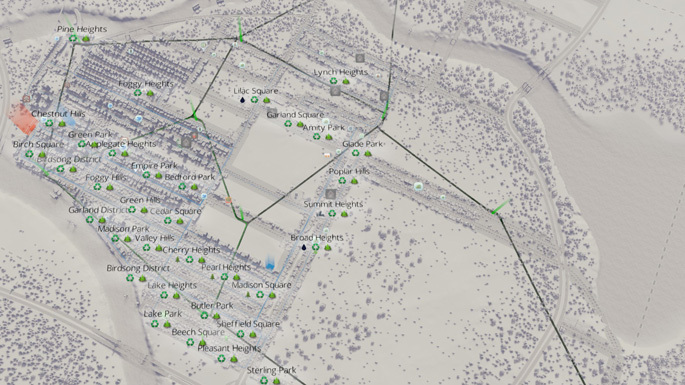 If you think you’ve found a way to create the most optimal intersection ever, hop into the asset editor and create it so that you can easily add it to your city and share it with the community. Think you can build a better metro/subway system than New York City or Tokyo? 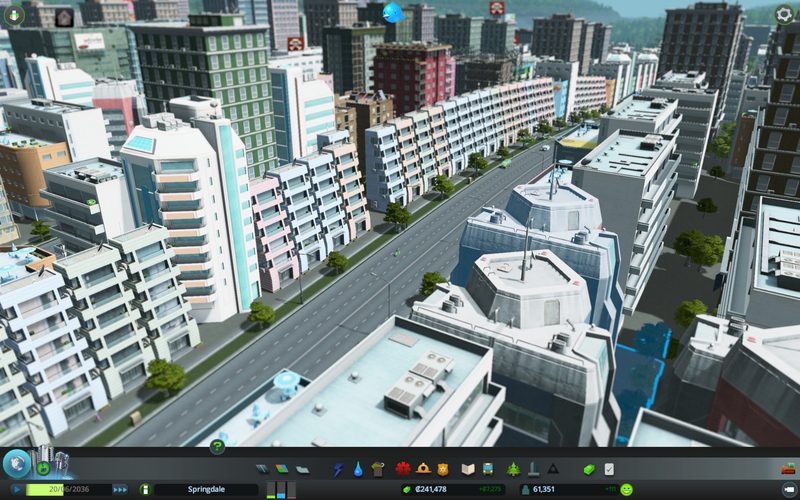 If by now you don’t get the idea that I really enjoyed my experience with Cities: Skylines, then here I am to confirm it. It’s by far the best city builder available in today’s marketplace and the Steam Workshop support only confirms its longevity within the community. The few issues that I have with the game are all trivial and can mostly be fixed with future minor patches if Colossal Order chooses to address them. Could the game benefit from an in-depth tutorial that gives more details on how things work and how to fix certain things once they happen? 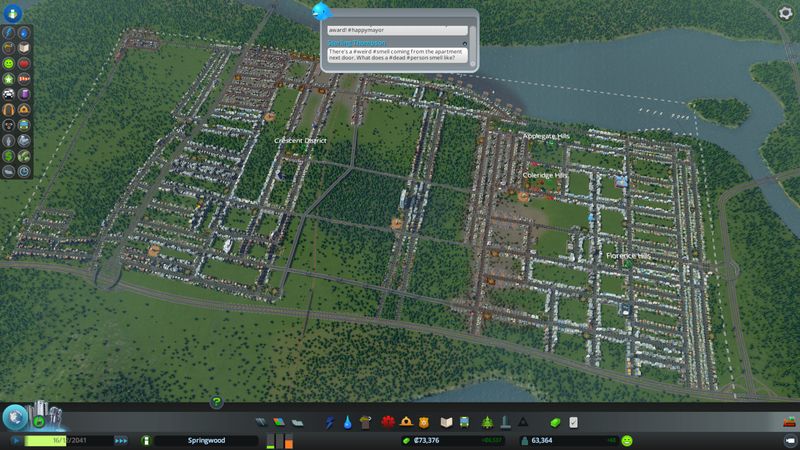 Sure, but part of enjoying a city builder is to learn things on your own. 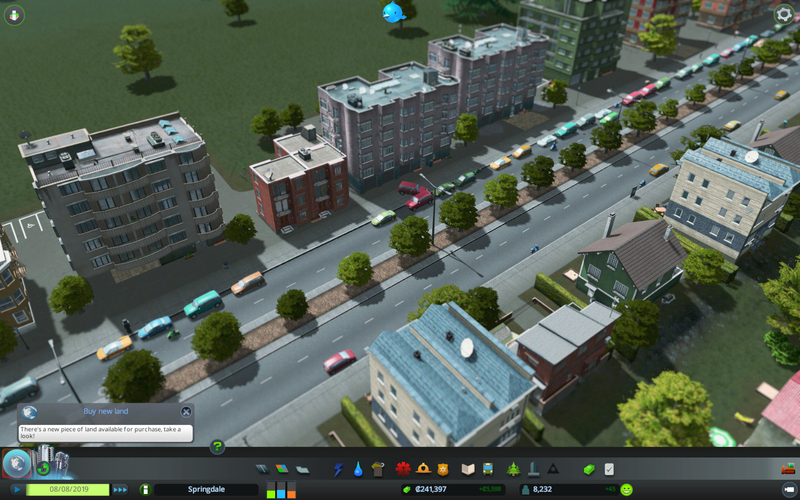 There’s really no better satisfaction than figuring out how to free up traffic so that the hearses can pick up the dead and your citizens can stop complaining about that smell. 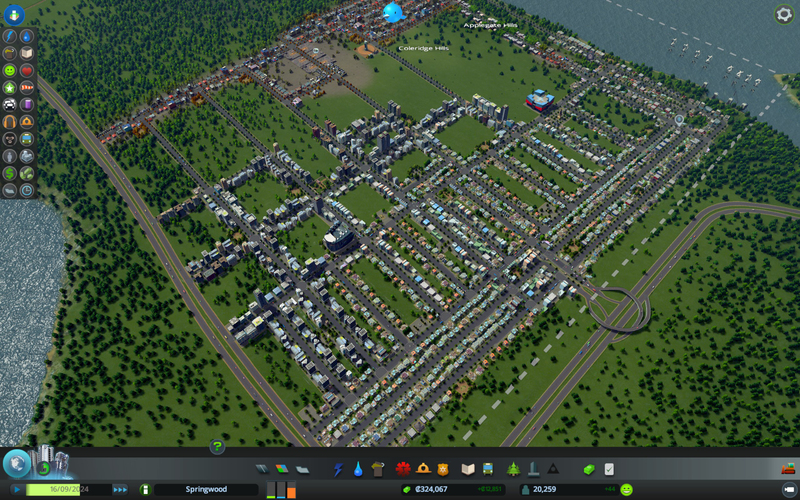 It’s not the ultimate city builder that everyone hopes and dreams of, but it’s important to realize that for the first time in years it’s moving towards the right direction. 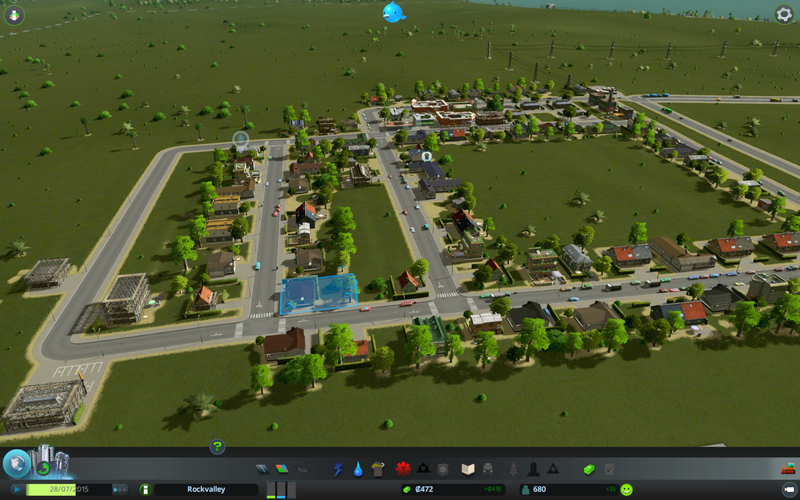 I personally think that Cities: Skylines would benefit greatly from a multiplayer component similar to what SimCity offers, especially considering you have access to a total of nine tilesets by default. Having a buddy build alongside you sounds pretty entertaining, especially if each person was in charge of their own tileset before connecting the two together. 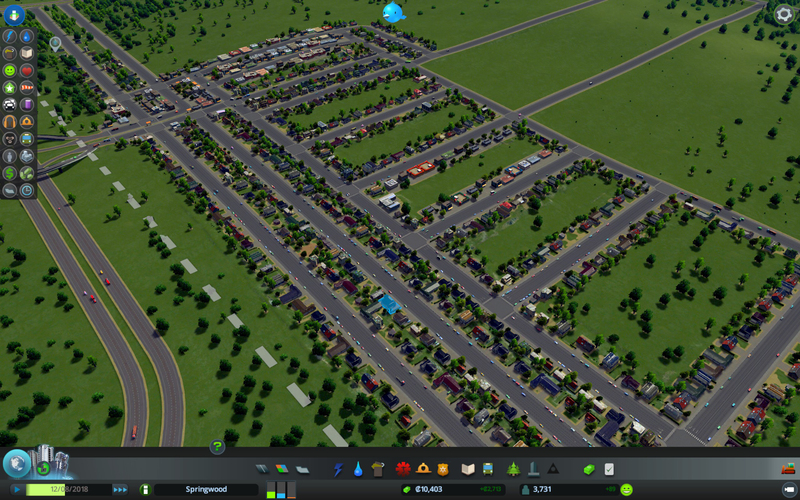 Regardless, if you’re a fan of the city builder genre, the price of entry might be the best part of Cities: Skylines. At a normal price of $29.99, you don’t even have to wait until a seasonal Steam sale to take the plunge. Just make sure you have a lot of free time on your hands and you might want to stay away from Twitter for a few days… that blue bird will never look the same. 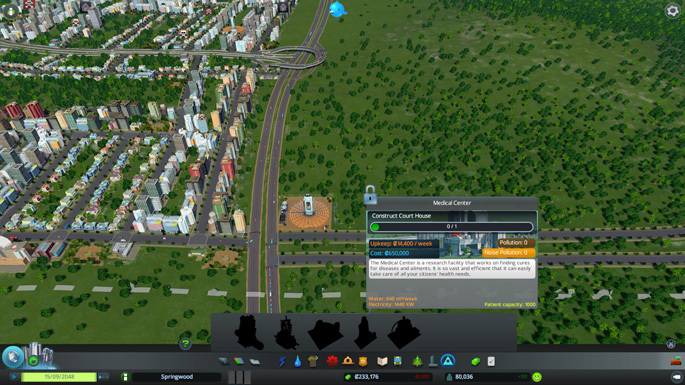 There’s plenty of goals to reach for in Cities: Skylines.